Trained in traditional photography techniques at the School of Visual Arts in New York, Lorna Simpson began pursuing innovative approaches to addressing serious social issues, fueled by her belief in the potential of art to inspire change. Rather than adopting the documentary mode used by many earlier African-American photographers to address slavery, racism and other aspect of African-American experiences and history, she approached these themes indirectly through metaphor, autobiographical imagery and language. Simpson typically assembles her compositions from a number of disparate parts and allows viewers to provide their own interpretations to invent or complete the narrative. With its combination of a small group of black and white photographs with enigmatic texts, Counting is typical of the images that earned Simpson early recognition . 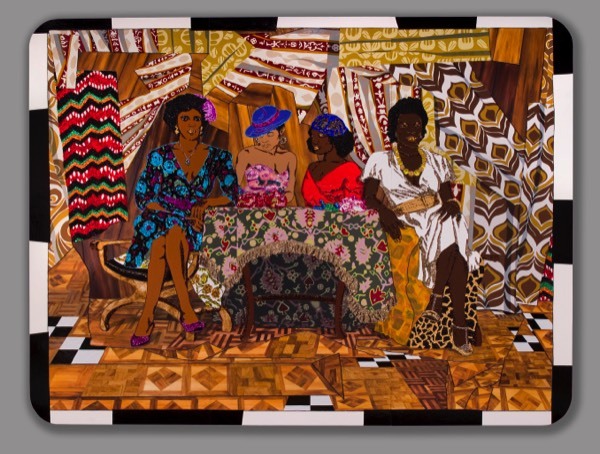 These compositions typically feature African-American women whose identities are obscured alongside oblique references to social historical? Racial? injustices. In Counting, a cropped female figure is shown in the simple white shift dress Simpson favors for her subjects. The model appears over the images of a smokehouse or slave hut on a plantation. The hut in turn is superimposed above a photograph of a braided bun, setting up the visual sequence of disparate parts. Much of the accompanying text—including the hours alongside the woman—is ambiguous, although “310 years ago” to the left of the smokehouse is said to reference the date slavery was first recognized in the United States. Counting thus references the passage of time, both personal and historical, as well as the conflicts between rationally-based Western thought and the emotional nature of human experience. 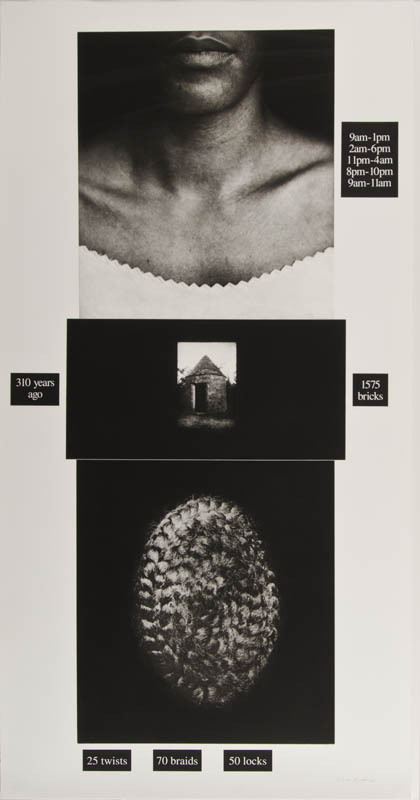 Lorna Simpson was identified as one of the most important younger artists working with conceptually-based photography when the Akron Art Museum purchased Counting in 1995. 24 x 48 ¼ in.